One day he receives a phone call from Nancy, a businesswoman who needs some legal advice. She asks to schedule an appointment for Thursday. – Ugo, I’ve looked at my schedule and I was wondering if I could come to your office on Thursday. – Thursday… I’m sorry, Nancy, but that’s not possible unfortunately. I go to prison. – You go to prison? Really? – Yes, I’m sorry. I have to. – Oh…uh…well, in that case I think I’ll call you back later, ok? Thanks. Nancy never called back, and Ugo lost a potential client. What did Ugo do wrong? He misused articles! 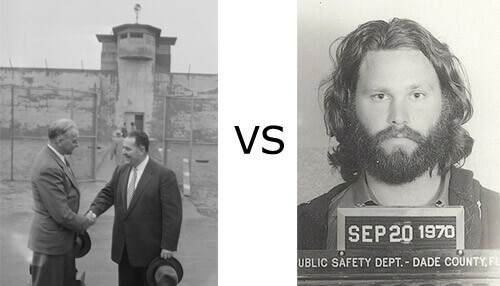 He confused ‘go to prison’ and ‘go to the prison’ – one little word can make a huge difference. As you can see, omitting an article can be a costly mistake. What a big difference a small article can make! If like Ugo you also feel confused about English articles, read on. All you need to remember are 2 simple questions – let me explain. To choose the right article in English just ask yourself two simple questions: 1. Is the noun countable? 2. Is the noun definite? All right, let’s see what those questions mean. Question 1: Is the noun countable? 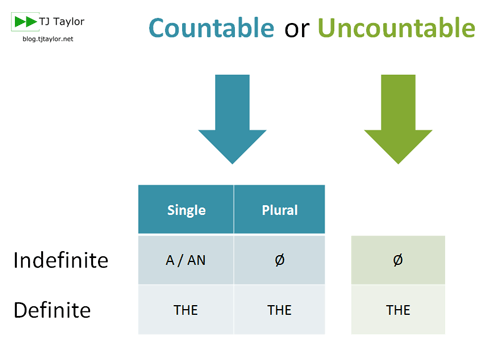 Countable means that the noun can be counted. For example ‘book’ is countable and we say ‘one book’ or ‘two, three, or several books’. Uncountable nouns cannot be counted and represent something that is not divisible, such as a quantity, or a material, or an abstract concept. For example ‘bread’, ‘air’, ‘water’, and ‘love’ are uncountable because they cannot be reduced to a unit. 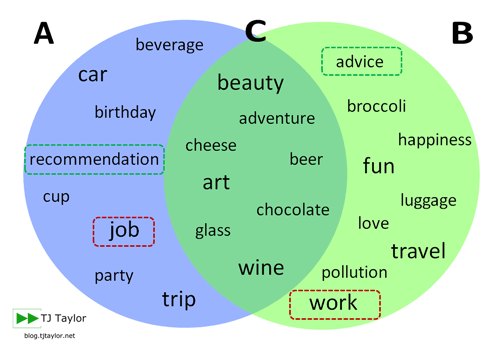 The third category causes many difficulties for English learners: some nouns can be either countable or uncountable depending on their meaning. For example ‘chocolate’ is uncountable when it refers to the food that we use in cooking or that we love to eat (‘I prefer dark chocolate’), but it is countable when it refers to the drink (‘a hot chocolate’) or a small, chocolate-covered candy (‘Belgian chocolates’). Another example of this third category is ‘adventure’: it is uncountable when it means taking part in dangerous and exciting experiences in general (‘I love adventure’) but it is countable when it means a specific dangerous and exciting experience (‘a great adventure’). Why are those categories difficult for English learners? Because they don’t always match your native language. For example, in Italian ‘lavoro‘ can be translated as ‘work’ or ‘job’, but only ‘job’ is countable. So if you refer to a specific working position (un lavoro), you should say ‘a job’. But if you mean professional activity in general (‘il lavoro‘), you should use the word ‘work’ with no article in front of it. Another example is ‘un consiglio‘: ‘advice’ is the correct translation but it is uncountable, so if you want to refer to a specific ‘consiglio’, you should say ‘a recommendation’ or ‘a suggestion’. How do you know if a noun is countable or not? Unfortunately nothing in the form of the noun will tell you that. So, when learning new vocabulary, you need to study the words themselves and whether they are countable or not. To help you remember, you can choose to use a specific color to highlight uncountable nouns in vocabulary lists, or you can memorise them with an example sentence that shows how they are used – for example, ‘John gives good advice’ will help you remember that ‘advice’ is uncountable. Also, you can always check whether a word is countable or uncountable in a good dictionary, such as the Longman Dictionary of Contemporary English. Question 2: Is the noun definite? What does ‘definite’ mean? A noun is definite if it refers to an object that is known by the person who is speaking and by those who are listening. In other words, the object that is being referred to is obvious to everyone. For example, if I ask you to “close the door”, you know which door to close because there is probably only one door to close. So ‘the door’ is definite because it is obvious to you and to me which door to close. We both know what object I am referring to. Now let’s look at how objects become definite. What makes nouns definite? There are 5 situations that make nouns definite. Yesterday I went downtown and bought a smart phone. I took a bus to come back. It was very crowded. A person pushed me while I was on the bus and I dropped the phone. Fortunately it didn’t break. Notice how the smart phone is not definite (or, indefinite) when it is first mentioned. However, when it is mentioned the second time, it becomes definite, and so ‘the’ is used. ‘The’ is the article we use when the noun is definite. The sun shines a lot in Italy. The squirrel is a nervous animal. We can see that ‘the sun’ and ‘the world’ refer to unique entities. Indeed ‘the sun’ refers to the one we see every day, while ‘the world’ is our planet, the Earth. In our minds those objects are unique. In the third example ‘the squirrel’ is a generalization: it means all the squirrels in general. It represents the animal category of ‘squirrels’. You will find our price list in the attached document. I will start my presentation as soon as you have received the handouts. Here the context is clear enough for both speaker and listener to know which object is referred to. In the first situation you know which ‘document’ is being referred to: the one that is attached to the email. In the second situation ‘the handouts’ must refer to the ones that you can see being distributed at the moment. Our company will pay the cost of your plane ticket to Rome. The smart phone that I bought is great. The extra information in the first sentence is called a noun complement (‘of your plane ticket to Rome’), and in the second sentence it is a relative clause (‘that I bought’). This extra information makes the object definite and is needed to understand the sentence. Indeed, if I say only “our company will pay the cost”, you don’t know what I mean. The cost of what? This is true of the second example too. If I remove the relative clause and say “the smart phone is great”, my sentence is incomplete and unclear. Which smart phone? Yours? Mine? Or smart phones in general? The most important issue here is safety. Ranking or comparing objects make them definite because they are compared to other ones, and so they are identified by contrast. In total 12 people have walked on the Moon, but Neil Armstrong is identified as ‘the first’. Also, in the second example, we consider that there are several issues, but the safety issue is compared to the other ones and so becomes definite. 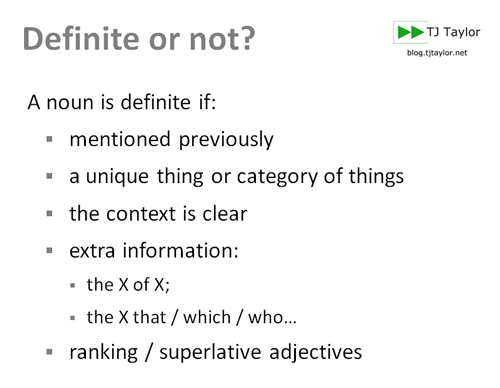 You notice immediately that articles vary according to the type of noun (question 1), to the context (question 2), and to quantity (singular or plural). The symbol Ø means ‘zero article’ – in other words, there is nothing before the noun. Also, some forms are identical (‘the’), so you don’t have to memorize many article forms. And that’s good news! There are many lawyers and Nancy is one amongst many. We refer to lawyers in general, not a specific group of lawyers. The extra information (relative clause: ‘you sent me’) specifies which letter we are talking about. The context makes it clear. We are talking about nature in general. The extra information specifies which wine we are talking about (‘that they produce’). Naturally some uses of English articles are idiomatic: the questions above don’t apply to them. There are 2 types of nouns that require your special attention. Continents, countries, towns, streets, mountains and buildings are preceded by the zero article. Plural countries and mountains, as well as seas, rivers, deserts, and geographic regions are preceded by ‘the’. Home / town: No article precedes ‘home’ unless you add extra information (for example an adjective) or ‘town’ when it refers to your own town. I am in town now – I am shopping. Bed / church / court / prison / school / college / university / hospital / work: No article before those nouns when they refer to an action rather than a place. So logically the people who ‘go to prison’ are prisoners, those who ‘go to school’ are children, and those who ‘go to hospital’ are patients. However, if you refer to the building itself, you should use the article ‘the’. Parents are going to the school to meet the teachers. Nancy is going to the church to see the beautiful windows. The lawyer will go to the prison to see his client. Now that you have learnt the 2 simple questions and you know which article to use – what’s missing? Practice! Only practice can make choosing the right article effortless. Only practice will make it automatic. Ask your English teacher for some exercises on articles, or search online – there are lots of good grammar websites. To get started, there are some exercises here and here.